China, on the other hand, stayed at the second place in the pool with two draws in a row. Though both Australia and China have one match in hand, the former will finish at the top pool irrespective of the outcome of their last match against China. England and Australia could not be separated in the first two quarters of their Pool B meeting, with both sides having good chances to break the deadlock. The goalkeepers excelled, with England’s George Pinner making two fine penalty corner blocks to deny the Kookaburras before Tyler Lovell pulled off a miraculous stick save from Mark Gleghorne’s penalty corner drag-flick to deflect the ball over his own crossbar. Australia were the better team in the third quarter but were thwarted by some solid defensive work from England. However, their resistance was ended by two quick Australian goals in the fourth quarter. Jake Whetton found the bottom left corner of Pinner’s goal with a pinpoint accurate slapshot in the 47th minute before Blake Govers smashed home a second three minutes later. 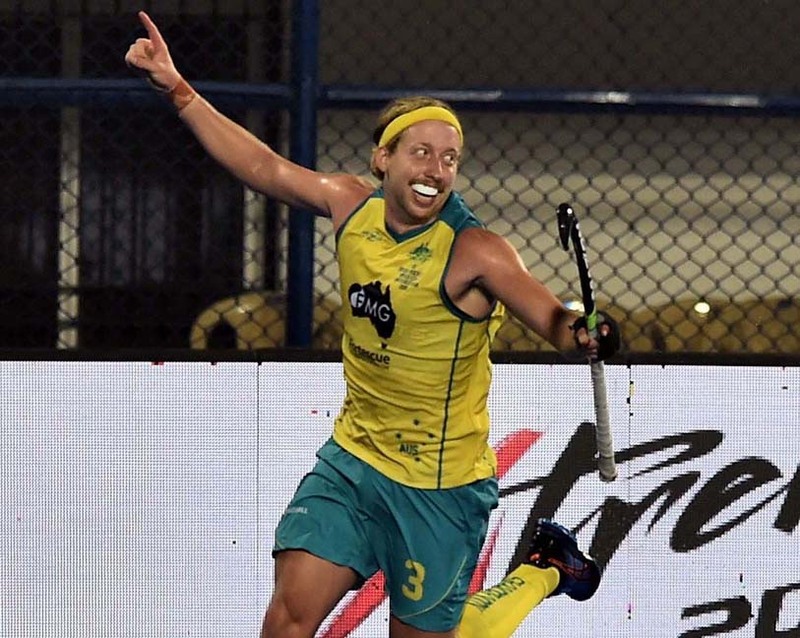 A 3-0 score-line was completed four minutes from full time by Corey Weyer, who rattled the backboard with a low backhand effort to give Australia their second win from two matches. Like the Australia-England match, the contest between Ireland (WR 10) and China (WR 17) remained scoreless throughout the first two quarters. Ireland continued to pressurise the China goal, with Alan Sothern shaving the post before a dramatic final three minutes of the third period. A yellow card five-minute suspension to Ireland’s Jonathan Bell was followed by the opening goal of the match, with China being the beneficiaries. Guo Jin finished off a beautifully worked penalty corner routine with a glorious high finish that went in off the left post to give China a shock 1-0 lead. Incredibly, Ireland – still down to ten players – found the perfect response, with Sothern diving in to touch home Michael Robson’s perfect backhand pass from left field. Dec 4 (Match No 13, Pool-B): Australia (Jake Whetton 47-FG, Blake Govers 50-FG, Corey Weyer 56-FG) beat England 3-1. PoM: Matthew Swann (Australia). Dec 4 (Match No 14, Pool-B): China (Guo Jin 43-PC) drew with Ireland (Alan Sothern 44-FG) 1-1. PoM: Alan Sothern. TOP: Corey Weyer celebrates after scoring the third goal for Australia against England on Dec 4, 2018. 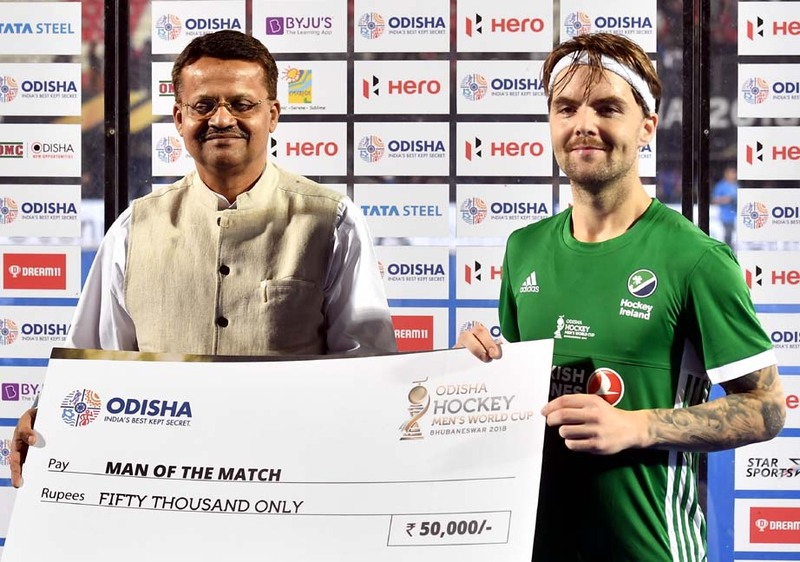 RIGHT: Ireland player Alan Sothern receives the Player of the Match award from BJD Parliament Member Bhartruhari Mahtab on Dec 4, 2018.